After a few days of uninstall, reinstall hell with chrome, adobe flash, and filmstruck chat help, I've settled on a third browser - Firefox. Chrome stopped working with plugin (adobe flash) not available errors, so I started a few chat sessions with Filmstruck tech support, and got it to finally work, then it stopped working. With Chrome, for whatever reason, you have to uninstall then install adobe flash using Internet Explorer, so it's a back and forth with the two browsers. Now for the last couple days Firefox has been running like a dream - no spinning wheel buffering issues. Hope it lasts. Using Windows 7 Professional on a PC. Any news on new platforms being supported besides PC/Mac, IPhone, IPAD, and Amazon Fire TV/Stick? You can now sign up for email notifications of when they add specific devices/platforms. If you're asking about streaming devices, they added Chromecast a little while back. Noiradelic wrote: You can now sign up for email notifications of when they add specific devices/platforms. Thank you very much. Really enjoyed the free 3 mos but I will await the PS4 or ROKU filmstruck apps to watch it on a bigger screen. I know I can just connect my PC via HDMI but I prefer the above better. This is also the corrected link to sign up . Criterion Live at the Metrograph - filmmaker D. A. Pennebaker, writer Frank Rich, and expert Jill Drew joined us at New York’s Metrograph theater to celebrate The Kennedy Films of Robert Drew & Associates. Antichrist added, with commentary and 16 supplements. Watched Queen to Play the other day, and I was trying to place the actress - Sandrine Bonnaire, who played opposite Kevin Kline, and of course I'd seen her in Agnes Varda's Vagabond. Was looking for another film to watch and chose Claude Chabrol's La Cérémonie, and there's Sandrine again. 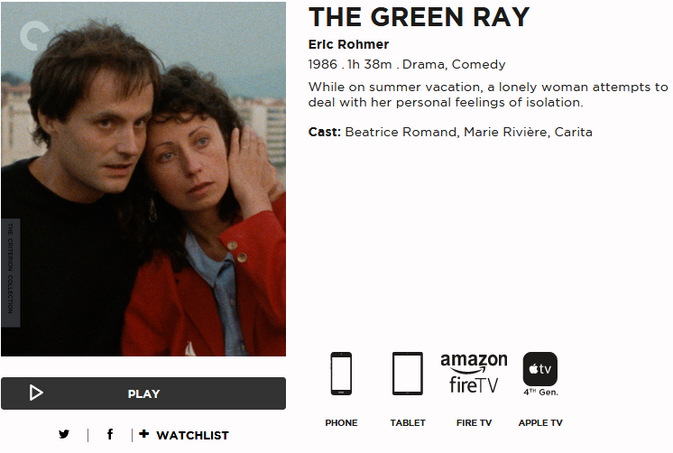 Then I realized that Chabrol coauthored my favorite film book - Hitchcock: The First Forty-Four Films with Eric Rohmer. Host-creator John Pierson in conversation with Richard Linklater, Miranda July, Kevin Smith and more! Pierson will host an evening of clips and conversation with in-person appearances from Split Screen collaborators, including filmmakers Richard Linklater (BOYHOOD), Kevin Smith (CLERKS), Miranda July (ME YOU AND EVERYONE WE KNOW), Chris Smith (AMERICAN MOVIE), Daniel Myrick (THE BLAIR WITCH PROJECT), and surprise guests! Created and hosted by indie film pioneer and author John Pierson, SPLIT SCREEN gave viewers an insider's look at the world of independent film and the fringes of the cinema-loving community in the late 1990s, when Pierson and his band of cinephiles roved the U.S. seeking pockets of movie madness. With material ranging from intimate encounters with mavericks such as John Waters and Herschell Gordon Lewis, to the premiere of the first footage of what would become THE BLAIR WITCH PROJECT, to the opening of the world's most remote movie theater in Fiji, this irreverent and clever series was like nothing else on television at the time and remains a candid portrait of a turning point in American cinema. You can stream SPLIT SCREEN on the Criterion Channel on FilmStruck, along with the largest library of indie, arthouse and foreign films. For more info, check out FilmStruck.com. Remember when Kevin Smith and Richard Linklater's names were uttered in the same sentences on a regular basis? I still wonder why that guy hit his ceiling so fast and was so unmotivated to break through it. Le Crime de Monsieur Lange added to Filmstruck. D50 wrote: Le Crime de Monsieur Lange added to Filmstruck. Criterion sent a press release with information about all of its new Filmstruck offerings for May. While there's other info (adventures in filmgoing w/ Guillermo Del Toro, for instance), I've copied what really matters below. Latest word on Roku availability (per help desk chat a few minutes ago) is "late May to mid-June." "You are correct, those are the only episodes that we currently have for Romanzo Criminale: Season 2. I will be sure to pass along your concerns to the appropriate parties for review." Last edited by D50 on Fri Apr 28, 2017 8:30 pm, edited 3 times in total.